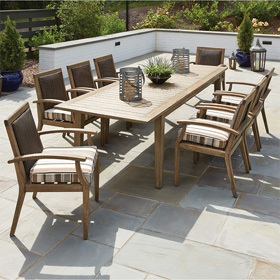 Offering seating for eight, the Metropolis Modular U-Shaped Outdoor Sectional by Woodard is an ideal choice for parties. This set than can be easily rearranged to fit your space invites groups to sit down on luxurious sectional pieces for an evening of chatting. A pair of ottomans provide a place to rest your feet after a long day. The set is completed by a side table perfect for keeping snacks nearby. All furniture in the Metropolis collection has full back and seat cushions guaranteed to keep you comfortable season after season. The extruded aluminum frames will not rust making this collection the perfect choice for pools and coastal areas. Corner Sectional 33"W x 33"D x 28.25"H 35 lbs. Armless Sectional 29"W x 32.5"D x 28.25"H 24 lbs. Ottoman 29"W x 24"D x 19"H 34 lbs. Table 32.25"W x 32.25"D x 11"H 35 lbs.